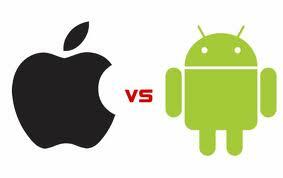 In the same way there's coke versus pepsi fans or New York Yankees versus Red Socks fans, there's iPhone and android fans. I am an android fan, a publicly declared one. I've written about it and publicly spoke about it too. So, the question is, how come I'm waiting and hoping for the next iPhone? On one side, there's a feeling I'm having, and this moment is reminding me very strongly of what happened back in 2007, when I blogged about the ipod comparing it with a pda cell phone and hoping for apple to do something smarter a few days before the first iPhone was launched. First, the tiny screen. They just can't continue to torture users with this tiny screen. Anybody that used a larger android phone knows what I'm talking about. They need to explore larger display options for cellphones and I'm 99% sure they will. Secondly, the one button. I know, this sounds impossible, but I'm strongly against the main central unique button. I believe the next iPhone will let go of the button and replace it with static soft buttons on the screen. I would love to see at least two main buttons, Menu and Return. Again, as an android user, I can't understand and I get frustrated on my iPad with not having the return button and having no other standard for such a basic feature that is central to all interactions with the device. 2. Innovation on the mobile market has been stalked for the last 3+ years. Most innovation is coming from the apps layer, but almost none from the OSs or hardware, with the exception of siri which seems yet green. There has to be a new wave of innovation coming soon and if I had to trust one of the two companies (Apple or Google) to make a big innovation leap, I will bet on Apple. The only interesting thing coming from Google we saw on the latest times, has been Project Glass, which is for now just ... a project. Small confirmation of how slow android is moving, is the launching of the Samsung Galaxy S III which was designed entirely by lawyers to avoid patent trolls. Once the rest of the players slowly but surely get out of the league, such as with LG not having any future plans for Microsoft cellphones, it is clear where the big battle is. On the other hand, some of the newest android devices such as Razr Max are getting better user reviews than the iPhone4s. If this was a chess game, the next move is on Apple's side. It remains to be seen as a spider organization when they lost their head ... But, still, if I had to bet on an Engineering based company or an Art based company at this moment, because of the type of innovation we need, I would bet on Apple.